Ceiling Fans Installation at Vishrampura School-Class Rooms. Installed several Ceiling Fans in Class Rooms of Vishrampura School, Near Vadodara, Guj India. Special thanks to Sponsor of this project. Donated Fax Machine, Printer, Telephone with Answering Machine, Easy Sofa Chair, Clothing’s 2 bags, Household things 2 bags and 4 Boxes of bread were donated. Thanks to sponsor and volunteers for this special job. Jimmy Hale Mission; 3420 2nd Ave North, Birmingham AL 35202. 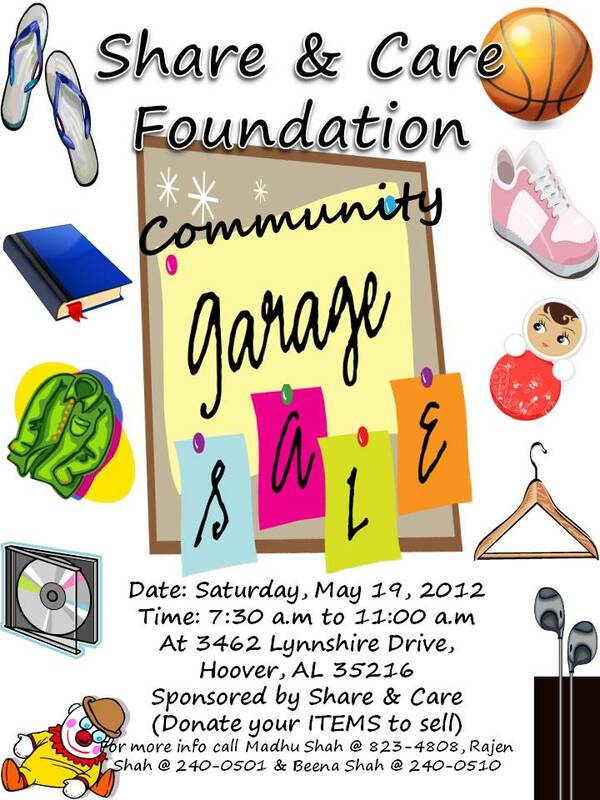 We will be hosting a Garage Sale on Saturday, May, 19, 2012 at 3462 Lynnshire Drive, Hoover, AL 35216. Please DONATE your Furniture, Toys, Computer, Video Games, DVDs, Tapes, Clothes, and Household items. We will pick it up and provide you a Tax Receipt for your donations. Share and Care Foundation and The Way of the Cross Ministries had arranged a Medical Camp follow up. April 01, Sunday at 2.30pm to 5.30noon: Follow-up, Dental Exam and Consultation with Doctors. More than 130 people participated. About 86 people had their Blood work. Fourteen Medical Doctors, Nursing Staff, and 18 Volunteers made this medical camp successful. Thanks to our sponsors, Mr & Mrs Robert and Tamara Starz and The Way of the Cross Ministries Director, Mr. Kenneth L Brown, Margaret Brown and Staff members. We are grateful to Dr. Dinesh Parmar, Dr. Kumud Shah, Dr. Hiren Patel, Dr. Vipul Amin, Dr. Snehal Khatri, Dr. Vinit Patel, Dr. Jay Patel, Dr. Dilip Shah, Dr. Andy Brunson, Dr. Kuntal Pandit, Dr. Shivani Pandit and all volunteers for their dedication and support.